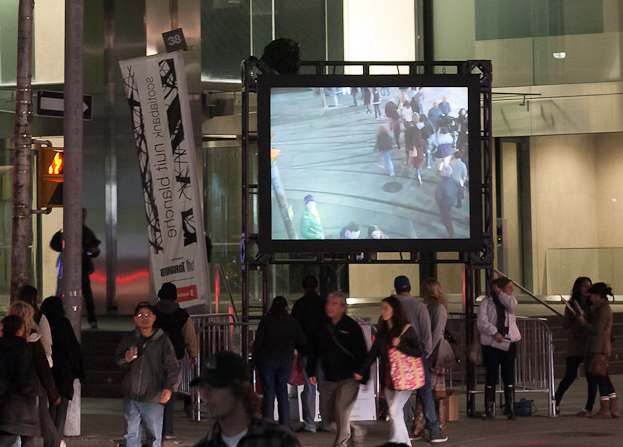 Utilizing live video feeds from four cameras, this work captures the flow of pedestrian and vehicular traffic on to four large screens situated at the four corners of the intersection of Adelaide and York Streets. The camera/screen configuration is such that each camera‘s feed is seen on the opposite screen so any individual facing a camera will be seen on the screen behind him or her, making it impossible to see oneself. The set up alludes to surveillance and although anybody that appears on one of the screens becomes a participant in the project, the configuration defeats the idea of the participant performing for the camera. This work is a continuation of the artist‘s interest in identity, interaction and presentation. Artist Biography: Michael Klein has been exhibiting still and moving image works for more than 30 years, most recently with venues such as the Art Gallery of Windsor; the Confederation Centre for the Arts Gallery, Charlottetown; Video Pool, Winnipeg; Truck Contemporary, Calgary; the Prairie Art Gallery, Grand Prairie; Hallwalls, Buffalo, NY; and *QueenSpecific, Toronto. His interests include personal history and identity, relationships and interaction, structure and presentation. He is also the director of Toronto gallery, MKG127.